You have TWO WEEKS to play along - Deadline to enter is Friday, October 2nd, 2015 at Midnight CST. The winners will be announced on the NND blog on Monday, October 5th. Post your project to your blog or to an online photo gallery such as Flickr, Pinterest, or splitcoaststampers (on splitcoast please use keywords newtonsnook and IPC25). This fun owl card by Danielle is perfect for Halloween! I love how she created a fun splatter background and used the sentiment for the owl to sit on. She used the Boo Crew stamp set! Check out the awesome background on this card by Yukari Yoshioka! Love that curved sentiment too! She used our Newton's Perfect Pumpkin stamp set for this card. Crafty Math-Chick created this fun Halloween card! That spooky house paper goes so perfectly with the house image from our Spooky Street stamp set! And I love the fun drippy edge on the tag! 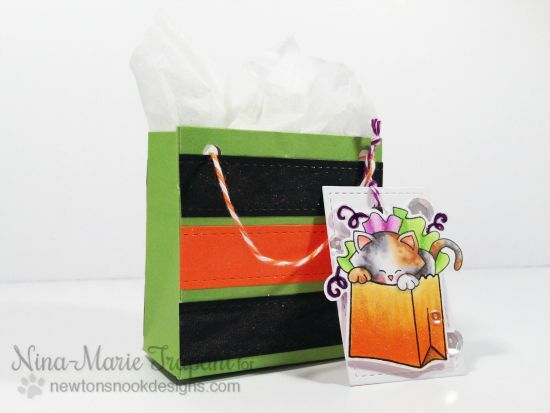 I love that Nina-Marie used a non-Halloween set to create this fun Halloween treat tag! 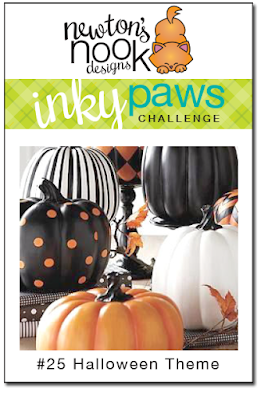 she used the kitty image from the Newton's Birthday Bash stamp set and Halloween colors to make it work! 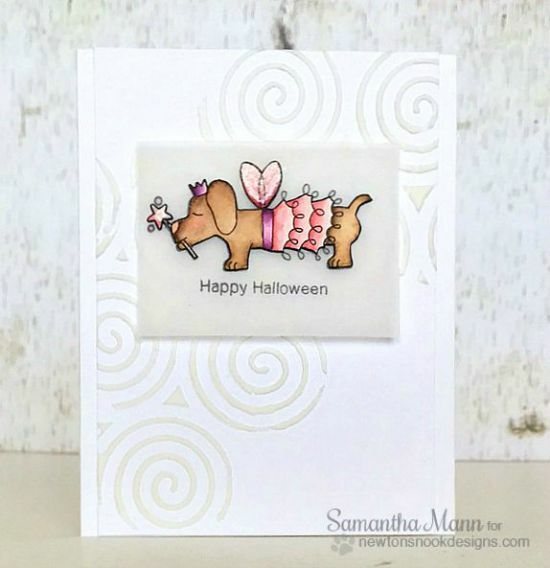 Samantha created this sweet and girl Halloween card using the puppy dressed as a fairy princess from our Boo Crew stamp set! So adorable! Stephanie used our Newton's Perfect Pumpkin stamp set for this cutie Halloween card! Isn't her paper-piercing on the had so cute? Oooh! Such a fun spooky scene by Kimberly! I love the fun inked circle she created for a backdrop for the scene. She used our Spooky Street stamp set. 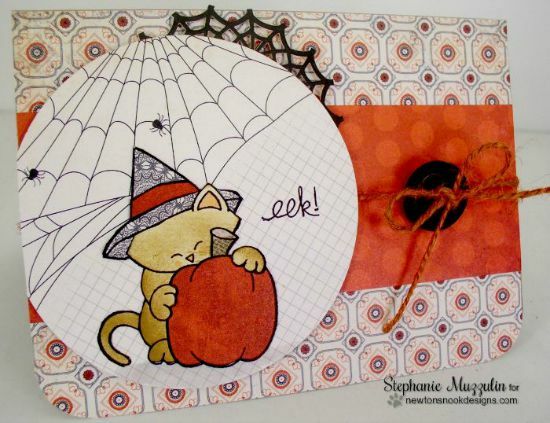 This gorgeous shaker card by Larissa is perfect for Halloween! I love the way she used our leaves from the Falling into Autumn set around the pumpkin and the "Happy Harvest" sentiment in the center!